We've seen what's coming for the 6-inch Hasbro "The Avengers" line this summer, and now we look back at what has come before. Today, we review the "Thor" movie line version of the title character, my favorite Norse deity and slayer of frost giants, the Mighty Avenger, Thor. This is another figure that Matt gave you a packaging-only review of a couple months ago. So it's my duty to now tear Thor free of his plastic prison for your viewing pleasure. Recently being sucked back into the 6-inch line, I've been expanding my movie-verse Legends display, and just added the single "Thor" movie-based figure to the shelf. Just as with the Captain America we reviewed yesterday, this Legends-scale Thor's packaging is basically a scaled up version of the 3.75" line's packaging. I liked all of the companion lines individual designs, and I appreciated the consistent design elements that went into creating each unique look. I am not a carded collector any more, but if I still were, I'd certainly want carded samples of figures on each of the main line looks for 2010/2011 - Iron Man 2, Captain America, and Thor. This packaging again features the "Only at Walmart" sticker, which serves almost as a message to some that reads "good luck ever finding me on a store shelf, sucker!". Given Walmart's notoriously crappy distribution, I am dumbfounded as to why Hasbro would give them the exclusive on the entire line of 6-inch Marvel movie-verse figures. But I digress. The back of the card again features full-body shot of the figure, his bio, and a cross-sell featuring the other two figures in this line, comic-based Lord of Asgard Thor and Loki. The sides of the bubble insert again feature the design elements that would carry the figure number in the 3.75" line, but there are no figure numbers assigned to the 6-inchers. The sculpt on Thor is again impressive, with a high level of detail in his arm and chest armor, as well as the sculpted fabric of his pants. 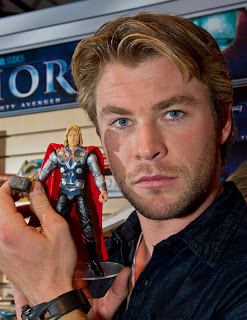 The face sculpt resembles Chris Hemsworth pretty faithfully, but the eyes appear to be just a little bit too close together. He has an almost cross-eyed look. If this head sculpt looks familiar, it's because it's the same as the one used for the recent Avengers line Sword Spike Thor. Apparently this head sculpt was reduced down and re-cast for that figure. The rest of this figure is a unique sculpt, however. The cape also features a lot of detail and folds in the "fabric", and is permanently attached in place, so it won't fall off when you look at it side ways. The one bad thing about the cape; on the right side, it's a bit too long for the figure, making it difficult to stand him up straight. This is a minor issue though, as if you pose him correctly, you can make the cape act as a support, preventing him from tipping over. Articulation here is slightly less impressive than Captain America, but still good. We've got a ball jointed neck (no neck hinge), ball-hinged shoulders with bicep swivels, double jointed elbows, swivel wrists (no hinge), mid-torso swivel, ball hinged hips with thigh swivels, double hinged knees, and ball hinged ankles. Definitely superior to anything you'll find currently in the 3.75" movie line. The deco looks good and is pretty much faithful to its on-screen counterpart. The plate-mail on the arms features a nice dark wash to bring out the sculpted detail. The colors are applied well, with no over-spray or smudging, unlike most recent 3.75" figures. Despite the cut-backs and quality issues on the smaller scale figures lately, you can tell the Hasbro really is catering to the collector segment with these 6" figures. The quality standard is much higher. As for accessories, well, you get Mjolnir. Pretty much the only accessory you could really expect with Thor, but it would still be nice if there were something else in the package. Maybe another Mjolnir, sculpted into the rock from which everyone tried to pull it? Or if you're not going to give us an additional accessory, maybe at least make Mjolnir able to be hung from Thor's belt or something. I just don't feel like there's much functionality here. Should you bother to pick this guy up? Yes, if you like the movie character designs, absolutely. Like the Captain America figure, this figure started showing up sporadically around the end of last year, and in some stores, immediately went to the clearance aisle. He can still be found hanging around a few places, and is easily found online for about retail price. More useless trivia: Just as with the Captain America figure, at last years New York Toy Fair, Chris Hemsworth was photographed with an apparent variant of this figure, featuring a helmet-less head sculpt based on his likeness. Unlike the Cap figure, it appears we will actually be getting this version of the figure, as Hasbro is apparently cheaping out on "The Avengers" line and re-using this body sculpt with that unmasked head, despite the fact that Thor's entire costume is completely different in the upcoming movie. But at least we're getting that head sculpt. In line with rolex replica sale somewhere around 30-40 mil phony wristwatches usually are constructed per year, and so you ought to know off devious suppliers which might be advertising hublot replica wristwatches. It's estimated that pretty much 40% connected with phony wristwatches usually are manufactured in China and taiwan, seeing that Far east makers are applying steps like representing this replica watches sale that has a snapshot on the true famous check out model within the cardboard boxes. You will additionally know that this phony type connected with almost any replica watches uk the marketplace prior to a true brand type. You will discover a couple varieties of phony check out. The primary style of counterfeited fake breitling sale usually are exhibited small charges, and have absolutely sub standard, efficiency in addition to pattern. Your second style of phony check out resembles fully the original custom made check out, having excessive costs. There're constructed having somewhat high class in addition to products.